Figure 1. 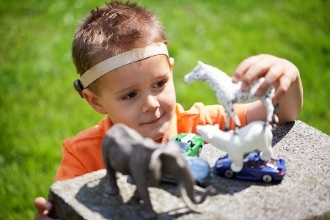 Child wearing a bone conduction hearing device on a soft headband. Due to anatomical abnormalities of the outer and middle ear or active middle ear disease, some children with permanent hearing loss are not candidates for AC hearing aids that direct sound through the ear canal. Bone conduction hearing devices (BCHD) can be placed or implanted on the mastoid portion of the skull to deliver sound through vibration and are routinely provided by pediatric audiologists (Figure 1). Unfortunately, fitting protocols for BCHDs to children are not well-developed, leaving gaps in clinical practice. These gaps make it difficult to properly measure the impact of BCHDs for children who wear them. For every 100 infants identified with permanent hearing loss, ~10 are not candidates for AC hearing aids. Therefore, within a clinic an expert clinician often manages this unique caseload. 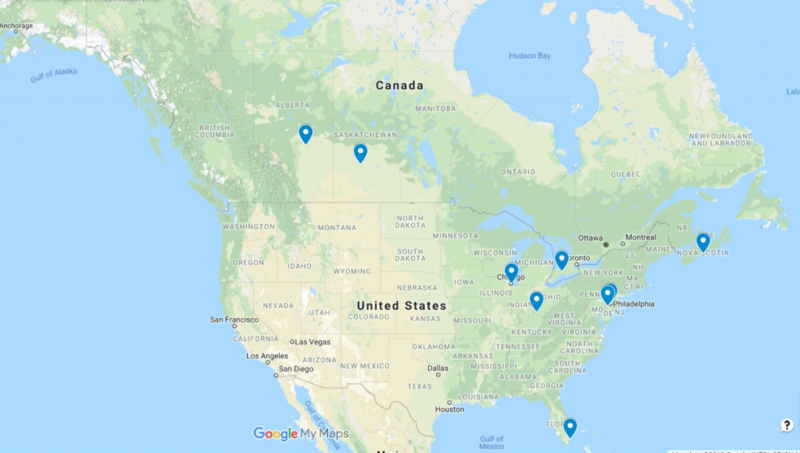 For the past three years, a Pediatric Bone Conduction Hearing Device Working Group* consisting of pediatric audiologists throughout Canada and the United States with expertise in BCHD fitting, has designed and executed informative projects related to BCHD fitting in children (Figure 2). In 2015, we conducted a survey of BCHD selection and fitting practices of 144 pediatric audiologists across North America. Results indicated that 13.68% of clinicians had access to a skull simulator for measuring the BCHD and 86.49% of the respondents used aided soundfield testing for verification of the devices. Of the pediatric audiologists surveyed, 68.47% indicated they did not feel confident in their fitting procedures and monitored the child’s outcomes closely. As follow-up, in 2016 the Working Group completed a retrospective file review for children aged birth to 6 years 11 months to further understand these practices. From the 65 files reviewed from six sites, it was clear that there are no consistent protocols being used for verification or validation of BCHD for children. Aided soundfield testing was still commonly applied, though the measurements differed widely with the type of stimuli used (e.g., warble tones, Ling 6 sounds (monitored live voice versus recorded), speech in quiet, speech in noise) as well as speaker azimuth (0 or 90 degrees). Results from both projects indicated that pediatric audiologists are applying their own fitting strategies because they are lacking the evidence and tools to fit BCHDs to their young patients. Prescriptive force level targets for BCHDs and the equipment to connect the device for verification were identified as specific areas of need. These tools, common for fitting AC devices, will allow clinicians to properly fit BCHDs to their pre-lingual patients. Recently, Hodgetts and Scollie6 developed Desired Sensation Level (DSL) adult targets for percutaneous BCHDs which are available in some fitting software applications. 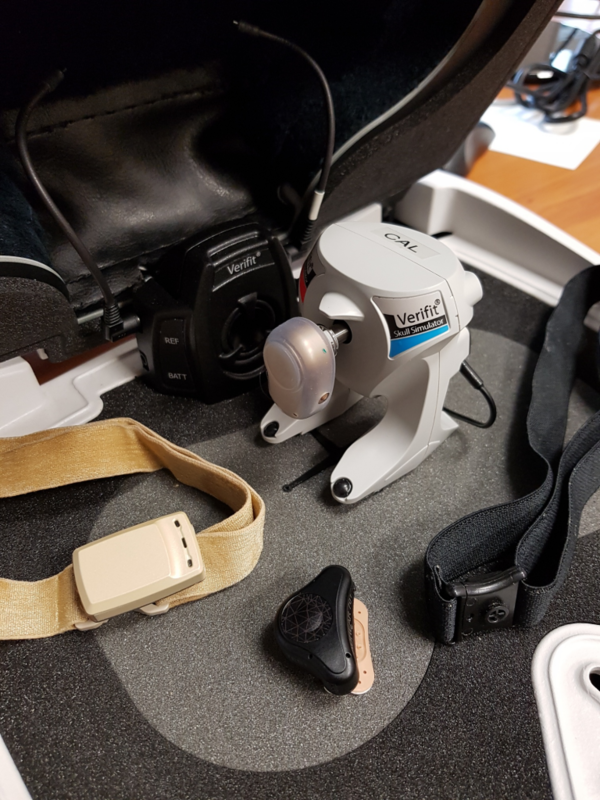 Additionally, manufacturers of hearing aid test systems have begun to offer skull simulators which accept all makes and models of BCHDs for verification (Figure 3). Figure 3. Various bone conduction hearing devices with soft headbands or adhesive strip. One device is attached to a skull simulator for verification. These systems also include the DSL BC targets to streamline the clinical workflow and support optimal hearing aid fittings. These innovative developments require refinement and evaluation for pediatric BCHD fittings. This is an exciting opportunity for the Working Group, who is motivated to develop and implement evidence-based fitting protocols in their daily practice to achieve the best outcomes possible for their patients. Moving forward, the Working Group aspires to conduct a systematic review and grading of the evidence to inform a detailed pediatric BCHD fitting protocol that includes the use of the DSL BC targets and skull simulator as well as a core set of outcome measurements suitable for infants and young children. The objective is to have members of the Working Group pilot the fitting protocol in clinical practice to assess its feasibility, efficiency, and effectiveness. This protocol development process aims to prepare us to conduct a larger prospective cohort study with collaborators such as pediatric otolaryngologists and industry. In time, an evidence-based pediatric fitting protocol for BCHDs will be available for clinical application. It is exciting to be part of this evolution to improve clinical practice through research and innovation. Bagatto MP, Moodie ST, Brown, CL, et al. Prescribing and verifying hearing aids applying the American Academy of Audiology Pediatric Amplification Guideline: Protocols and outcomes from the Ontario Infant Hearing Program. J Am Acad Audiol 2016;27(3):188–203. Bagatto MP, Scollie SD, Hyde ML and Seewald RC. Protocol for the provision of amplification within the Ontario Infant Hearing Program. Int J Audiol 2010;49:S70–79. Sininger YS, Grimes A, and Christensen E. Auditory development in early amplified children: Factors influencing auditory-based communication outcomes in children with hearing loss. Ear Hear 2010;31(2):166–85. Tomblin JB, Harrison M, Ambrose SE, et al. Language outcomes in young children with mild to severe hearing loss, Ear & Hearing 2015;36(1):76S–91S. Hodgetts WE and Scollie SD. DSL prescriptive targets for bone conduction devices: Adaptation and comparison to clinical fittings, International Journal of Audiolog 2017;56(7):521–30. Marlene Bagatto is an Assistant Professor in the School of Communication Sciences and Disorders and the National Centre for Audiology at Western University. She is Past President of the Canadian Academy of Audiology, Chair of the Canadian Infant Hearing Task Force, and Co-Chair of the Pediatric Bone Conduction Hearing Device Working Group. Dr. Bagatto’s research interests relate to policy and practice integration in the area of pediatric audiology.